Can you find the hidden message on this book page from 1953? 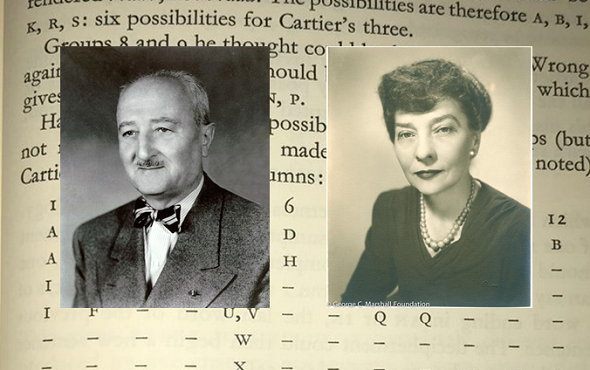 William and Elizebeth Friedman, two of history’s greatest codebreakers, published a book dubunking the idea of hidden codes in the works of Shakespeare. However, the book itself contains a code. Can you find it? Was Francis Bacon the real Shakespeare? If so, did he hide codes in the plays he wrote indicating who the real author was? US millionaire George Fabyan (1867-1936) believed in this story and hired a group of scientists to examine it. Fabyan’s research team never found any evidence for the existence of hidden messages in Shakespeare’s plays. Nevertheless, this group had an important influence on history. Two of Fabyan’s Shakespeare examiners, William Friedman and Elizebeth Smith, met at Fabyan’s research facilities and married in 1917. By working on non-existing Shakespeare codes both became involved in cryptography. While William grew to one of the most successful codebreakers in history, Elizebeth became a notable cryptologist in her own right. In the early 1950s, towards the ends of their careers, William and Elizebeth Friedman occupied themselves with the Shakespeare-code debate once again. 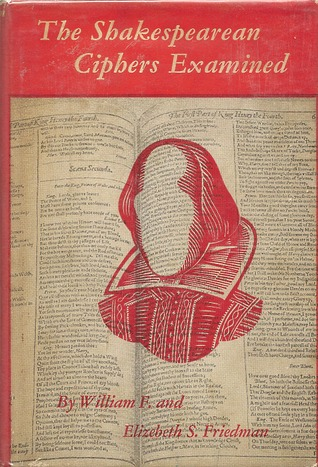 They published a book titled The Shakespearean Ciphers Examined (1953), which describes in detail each alleged Shakespeare code the two were aware of. According to the Friedman’s, not a single one of these codes proved to exist. 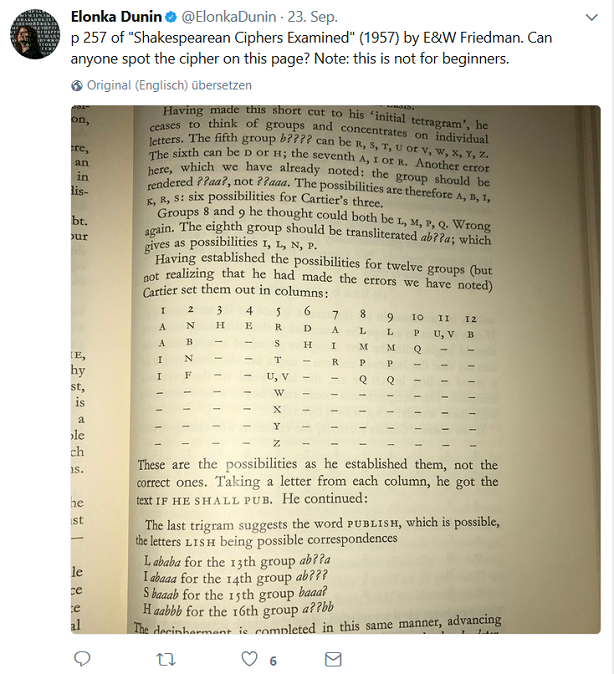 For almost all serious Shakespeare and encryption experts The Shakespearean Ciphers Examined marked the endpoint of the Shakespeare-code discussion. Today claims that Bacon (or somebody else) hid messages in Shakepeare’s work are generally regarded as pseudoscience. 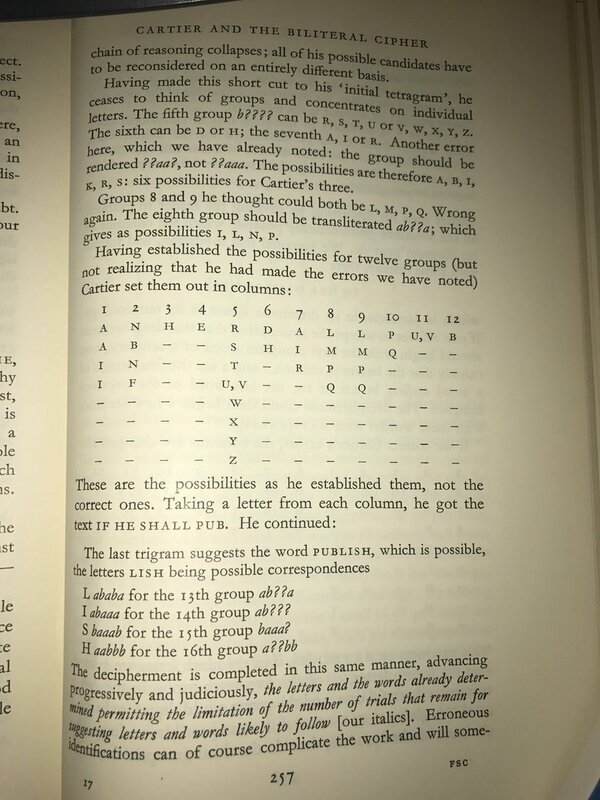 The text on this page discusses the Bacon cipher (see here for an introduction), a steganographic method invented by afore-mentioned Francis Bacon (the fact that Bacon worked in the field of steganography is one of the reasons why people sought for hidden messages from him in Shakespear’s plays). My guess is that the hidden message on this book page is encoded with the Bacon cipher. However, this is just a guess. Can a reader solve this challenge? In the last paragraph, the sentence printed in italics (the letters … to follow) looks like it contains two slightly different types of letters. I did not write the plays E. Bacon is the answer. Gerd is on the right track. You all beat me to it… but just wanted to say, this is one of my favorite books on cipher, and anyone interested in the subjects of cipher, or Shakespeare, should have it on their shelf. The ideas they applied to determining the veracity of the various Bacon claims for Shakespeare works can be applied to many similar claims for many other uncracked ciphers. 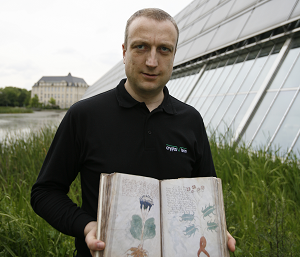 In the Voynich field, I see many failed claims of decipherment, the problems of which are obvious when seen through the prism the Friedmans develop in this book. And so it would also save much time and trouble for would-be decipherers if they would take the ideas of these brilliant people to heart, and self-check their own work, rather than repeat the same errors so many have in the past. But it is just a worthwhile, fascinating and entertaining book in its own right. You’re right, some italic letters are slightly different. But this is impossible to make out in the image above. You should download the pdf scan provided by the Marshall Foundation, http://marshallfoundation.org/library/digital-archive/shakespearean-ciphers-examined/, here you can magnify the letters. But still hard to make out the differences, maybe: hrsnddymndrnmtnumialhtfrsll? Maybe someone has a printed edition? Besides: The book is from 1957, not 1953. Looking at the letter sequence: Maybe a trasposition of “Friedman Marshall Foundation” or something like that? Now I doubt that it is a transposition because the Friedmans present a cipher using two fonts and a Bacon cipher on pages 31 – 34 of their book. Probably the italic letters passage on p. 257 is constructed in a similar way ( inner and outer message). The two fonts must be replaced with a resp. b.
I did not write the plays. F. Bacon. That’s it, got the same. The thin letters replaced with a, the fat letters replaced with b and then the Bacon table. The plaintext (without the page number of the book) is provided also in this article: https://www.nsa.gov/about/cryptologic-heritage/historical-figures-publications/hall-of-honor/1999/efriedman.shtml, cited in the Wiki article about Mrs. Friedman. >I did not write the plays. F. Bacon. This is correct! Elonka has confirmed it.